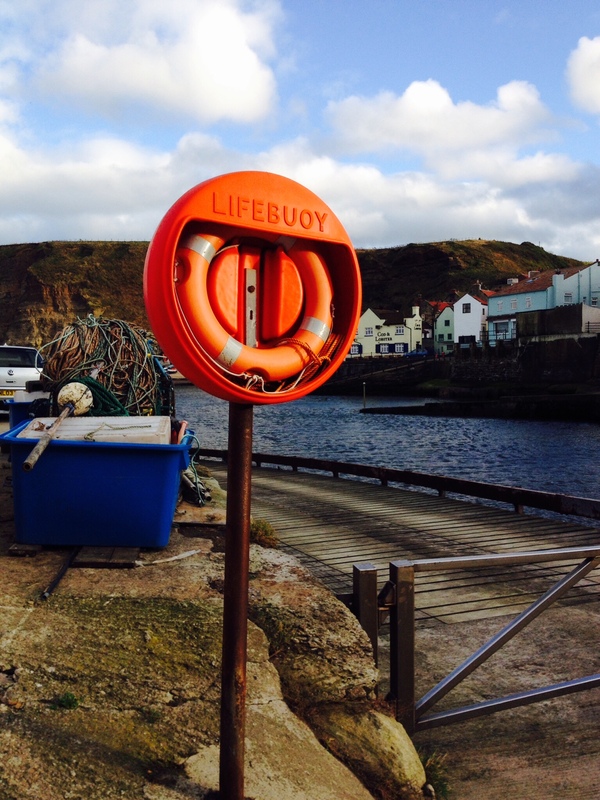 Northside cottage sits among a string of a dozen houses and a working lifeboat station on the waterfront in Staithes. Northside was formerly the home and studio of renowned artist Eric Taylor. Eric Taylor was the principal of Leeds College of Art, and he drew inspiration from the local land- and seascapes and the people of Staithes. You can see examples of his work in Kirkleatham Museum Redcar and the University of Leeds Brotherton collection. Northside is a three storey cottage. It has been lovingly restored and retains some of the age and patina of the place. Please take a look at the pictures to get an idea of what to expect. The location and views are stunning, with sea and harbour views from each room of the house. The front door opens onto Roxby Beck which is tidal, and is a haven for fishing boats and the home of the Staithes Lifeboat. There is a stone seat under the window where you can sit and let time and the world pass by. 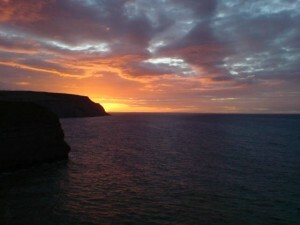 Get up early and you will see one of the best sunrises in England. 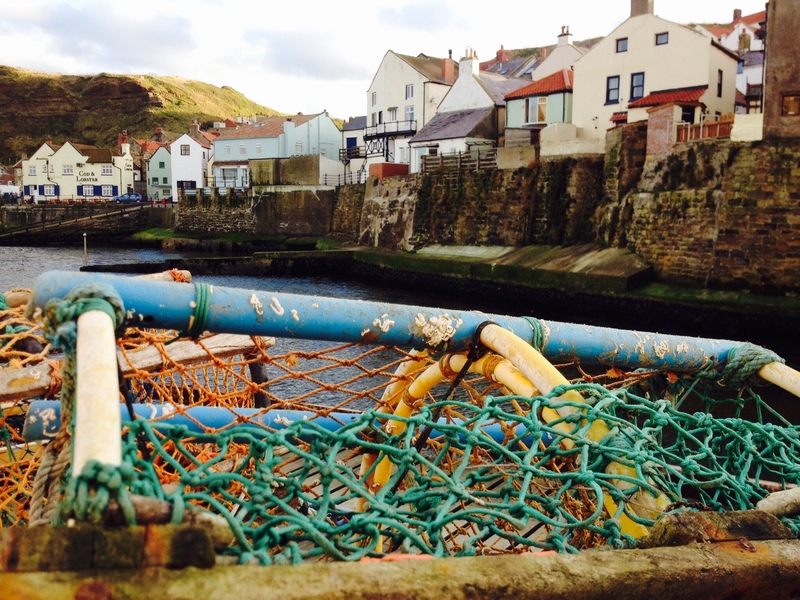 Staithes is all beautiful, but many prefer the south-facing Beckside. The cottage enjoys beautiful light for most of the day. Your view out to sea is framed by the harbour and there is huge ever-changing sky. At night there is minimal light pollution and you can view the canopy of stars. The moon sits over the harbour in October. Generations of artists have painted the views outside the cottage and around the village. People visit the cottage to holiday, work, write or paint. Peace and quiet are guaranteed. Equally, there is superfast broadband and Wi-Fi to keep you ‘connected’. The cottage can comfortably accommodate a couple looking for a quiet break; or a family with two children (three if you want to use a sofabed). The dramatic scenery and the fantastic walks make this a magical place to visit at any time of year. 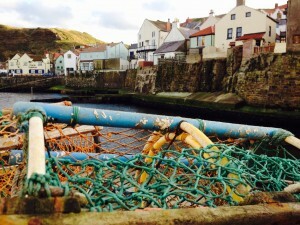 Each season is different and there is never a bad time to visit Staithes and the North Yorks Moors. From the door you can join the Cleveland Way, and walk as far as you like along the cliffs via a well-marked path. You can comfortably walk to Runswick and back with a stopover for lunch. At low tide you can explore the dinosaur coast in search of fossils and millions of years of geological history. There is an open fire, which makes the cottage very atmospheric and cosy. We can leave coal and kindling if you like. It’s amazing to return the cottage after a stimulating walk and make a fire. There are sea views from each of the three floors of the cottage and there is a sofa on every floor. You can park your car a few yards from the cottage and can load/unload at the door. It is most unusual to be able to park without having to walk up the hill. Very handy for older guests, those with children or guest who might struggle with 1:4/1:3 walk to the carparks. We have prepared a useful guide for guests which you will receive at the time of booking. This includes suggested walks, restaurants, pubs (and walks with pubs! ), day trips from the door (both on the coast and the North Yorks Moors). We have young children and have made suggestions about where you might eat, go rock pooling, find fossils or learn to surf. The cottage has a range of guide books with suggestions for nearby ‘walks with pubs’, and circular walks around the North Yorks Moors. Please note: the cottage is non-smoking. We can accommodate one well behaved dog. Let us know at the time of booking.